SER renewable energy executive recruitment search offers a professional global solution to secure you the perfect candidates for leadership and renewable energy senior management positions in the renewable energy jobs markets. Through our industry-renowned networks and proactive personal industry contacts, we provide only the most professional and effective solutions to reach a global audience. SER’s expertise with renewable energy executive recruitment search ensures you a successful solution. 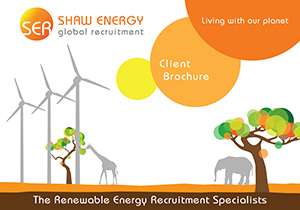 At Shaw Energy Recruitment we take renewable energy executive recruitment search seriously, with absolute passion. Our global expert consultants will always take the time to understand your fundamental executive requirements on every level and meet your demands to detail. Working within all renewable energy recruitment sectors and with a vast and ever expanding network of contacts and resources, we will thrive on the challenge and reach around the world to find your perfect long-term executive. We ensure maximum transparency with all our clients and candidates, and purely believe in a responsible and confidential approach to your worldwide renewable energy executive job placement. In our continuing mission for a greener and cleaner planet we now have online eco friendly brochures.